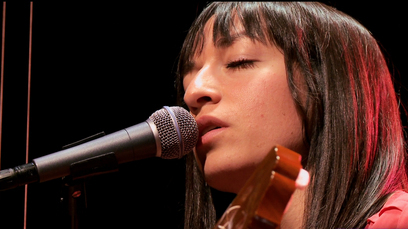 We’re still celebrating our Featured Artist – the wonderfully talented singer-songwriter Diana Gameros. Coming up tomorrow is an exclusive poster giveaway and on Thursday we’re offering the incredible chance to spend some time in the studio with Diana. The first time I heard this artist I wasn’t very into the tone of her voice, but after listening to a couple of songs, I realized that the tone only emphasized, for me, the melancholic nature of her music. This song, in particular, I enjoy because the lyrics speak about the moment of loss where we realize that things were falling apart but we were refusing to open our eyes, and see reality. I have many questions about religion and this song states very simply one of the many points I feel: “Don’t tell me, I was born in sin and shaped in inequity when love created I.” Also, I love that the inspiration for this songs come from words of Marcus Garvey. Elegant clarity on a difficult issue. Cuban rappers are on the frontier of expressing social and political issues. The first time I heard this song, there was no way I could ignore the power of the “new” band. Here was a new flavor but winning me over by having a song praising and quoting all the songs that make me miss my times back home. This is a cover but I dig this version a lot.